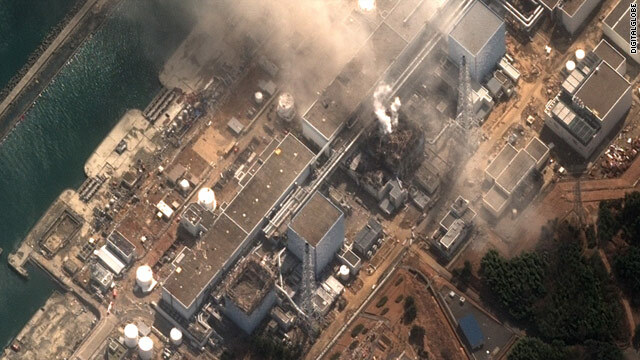 A satellite photo from March 16 shows damage at Japan's Fukushima Daiichi nuclear plant. (CNN) -- Workers at Japan's Fukushima Daiichi nuclear power plant have been scrambling to cool down fuel rods and prevent the release of additional radioactive material since a 9.0-magnitude earthquake and tsunami hit the area on March 11. Here is a summary of the status of each of the plant's six reactors and surrounding buildings, according to the non-profit Japan Atomic Industrial Forum and Tokyo Electric Power Co.
Seawater did more damage to Reactor 1 than previously believed, and the unit will take longer to repair than expected, TEPCO reported Tuesday. Fuel rods have been partly exposed, and the core of reactor is believed to have been damaged. The building that houses the reactor was severely damaged in a hydrogen explosion March 12, but the containment vessel -- the steel and concrete shell that insulates radioactive material inside -- was not damaged. Workers have been pumping a mix of seawater and boron into the reactor to prevent further core damage until coolant systems can be brought back on line. Coolant pumps and electrical components were damaged at Reactor No. 2, and the earliest those parts can be replaced is Wednesday, TEPCO reported. Officials say fuel inside the reactor has been partially exposed as temperatures rose and water levels dropped. Workers have injected seawater into the reactor. The reactor building has been slightly damaged, and a suspected explosion March 15 may have damaged the reactor's containment vessel. White smoke emerged from the building Monday and Tuesday, but the cause had not been determined. A pool containing spent fuel rods is a chief concern. Firefighters continued dousing the pool with water Tuesday to keep those rods, which contain radioactive material, cool. Gray smoke emerged from the building Monday. By Tuesday, the smoke was white and was dissipating. Officials have not said what caused it. The building was severely damaged in a hydrogen explosion March 14. At least one fire and an explosion severely damaged the building on March 15. The reactor does not contain any fuel rods, but the pool that houses the spent fuel rods is a chief concern. Crews used cement pumps to spray water on the pool Tuesday to keep the fuel rods cool. No damage is suspected in the reactor's containment vessel. Tokyo Electric Power Co. hopes to restore power to this reactor Tuesday, which could bring cooling systems back online. Workers created vent holes in the building's roof to avoid a hydrogen explosion. The cooling system is working and powered by a generator. That controls the temperature of the reactor, which is in cold shutdown, and the pool containing spent fuel rods.